The Heidelberg Stroke Unit is one of the largest European units for the treatment of acute strokes. In 2015, over 1.360 acute stroke patients were treated here and in the neurological intensive care unit. We focus particularly on acute re-canalization treatment together with our colleagues from Neuroradiology (e.g. systemic thrombosis and endovascular stroke therapy), which as a cross regional center, we also offer via a teleneurological network. We are constantly further developing these therapies through clinical studies. The Vascular Neurology program combines interdisciplinary patient care at the highest level, innovative clinical trial research and comprehensive students’ training in vascular neurology. The program strives to continue the ground-breaking achievements of Werner Hacke for clinical treatment concepts and research. Core Activities of patient care are provided by the stroke unit and semi intensive care unit (Neuro 5) in close cooperation with the emergency room team, the teleneurology service, the intensive care unit and the departments of Neuroradiology, Neurosurgery, Emergency Medicine, Vascular Surgery, Cardiology and Angiology. Clinical trial research of the program focuses on planning and conducting multi-center clinical trials, especially in acute treatment (ECASS4; Amiri IJS 2016) and prevention (SPACE-2; Reiff IJS 2014) of stroke. As a revolutionary break-through in endovascular stroke care, the MR CLEAN study - first presented at the World Stroke Conference 2014 in Istanbul - confirmed the superiority of mechanical thrombectomy compared with standard therapy including systemic thrombolysis in selected patients in an early time window. This result was impressively confirmed in four other studies, including the Euro-US SWIFT PRIME study (Saver N Engl J Med 2015, see figure below), in which Werner Hacke was a member of the Steering Committee. These novel treatment concepts offer severely affected stroke patients – for the first time - a good chance of recovering independently. At the Heidelberg Neurology Clinic, the complex medical, organizational and logistical procedure of thrombectomy is performed with the highest level of expertise by the Section of Interventional Neuroradiology (Markus Möhlenbruch) at the Department of Neuroradiology (Martin Bendszus) in collaboration with the emergency room, stroke unit and intensive care unit teams of the Department of Neurology. In 2015, the number of cases of endovascular stroke therapy was doubled and exceeded for the first time the number of patients who were i.v. lysed alone. 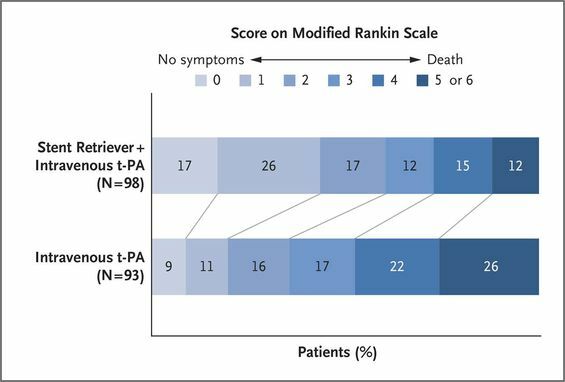 Out of 948 patients with acute ischemic stroke, 307 (32,3%) patients were treated with a recanalizing treatment, 76 patients with systemic thrombolysis, 110 patients with an endovascular stroke treatment (thrombectomy) and in 121 cases a combination of both modalities was applied. Thus, the Heidelberg stroke care system has a particular high proportion of patients treated with thrombolysis or thrombectomy, as compared with the state of Baden Württemberg with a rate of 14%. Towards outcome research, validation studies of the Stroke Outcomes Research Group (Christoph Gumbinger) confirmed for the first time the safety and efficacy of systemic thrombolysis in clinical routine (Gumbinger BMJ 2014). To demonstrate improved outcome and quality of care for stroke patients through collaboration and structural improvements, we have recently established a regional stroke consortium (Schlaganfallkonsortium Rhein Neckar; FAST, funded by the Dietmar Hopp Stiftung) in cooperation with 35 planned partner sites. FAST aims at providing best possible care for stroke patients in the region by joint SOPs, IT structures, logistics, education modules and a central coordination office. The goal is a measurable improvement in the care of stroke patients in the Rhein-Neckar region with a reduction in death and disability due to more frequent and faster adequate treatment. The network is intended to show paradigmatically how structural regional improvements in the quality of care can reduce the consequences of a widespread disease. Commissioned by the German Stroke Society (DSG) and German Neurology Society (DGN), Peter A. Ringleb defined in cooperation with the German Society of Neuroradiology (DGNR) the S2K-guideline "acute treatment of ischemic stroke catheterization therapy" (http://www.awmf.org/leitlinien/detail/ll/030-140.html). In addition, Peter Ringleb is a member of the steering group of the S3 guideline carotid stenosis (Eckstein Dtsch Ärztebl Int 2013) and participates as a peer for the national quality assurance project ‘Initiative Quality Medicine’ (IQM). Further Colleagues of the Neurovascular Section are members of the working group Stroke as well as in the working group Carotid Reconstruction of the GeQik®. To foster public awareness and education, the program organizes regular events for colleagues, patients and the regional population. The regular Heidelberg Open-Day and Stroke Day provide information on prevention and treatment options for acute stroke. The bi-annual Neurovascular Symposium organized by the Departments of Neurology, Neurosurgery and Neuroradiology (2014 and 2016) brings together colleagues of various disciplines to present and discuss data on current studies and novel endovascular therapy concepts.